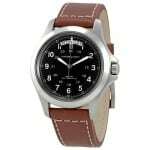 Hamilton Men’s Watch H70555533 Review. Hello, today I’m doing a Hamilton H70555533 review. A Swiss made automatic, that uses great components and remains very affordable, I’d say that’s worth checking out. Hamilton are well known for their high-quality Swiss made watches, this is one of their most popular models so I figured I would feature it today. Anyway, I’ll get on with my Hamilton H70555533 review below and you can find out the price on Amazon today, enjoy. 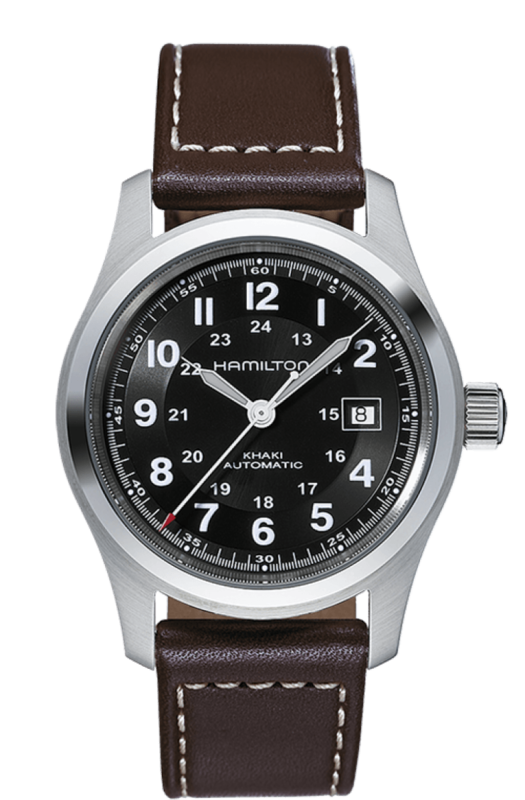 Hamilton are a high-quality watch brand known for their Swiss made timepieces. I actually featured them on our 10 best Swiss brands for people on a budget. When you consider you’re getting a Swiss made watch, with a Swiss automatic ETA 2824-2 movement and 38-hour power reserve, plus the sapphire glass, you’re getting a ton of great components for a really good price. The dial has a very clear design, I like the bold, large numerals that make the dial very easy to read. There’s a good use of lume as well that helps out in the dark. A little detail I like to note is the red tip on seconds hand, it’s just a touch of colour but I feel it makes the watch a little more interesting. One of my favourite features on this watch is the exhibition caseback that you’ll see in the pictures below. This allows you to peer into the workings of the automatic self-winding Swiss movement. I mentioned earlier on that the watch uses a very good Swiss watch movement. To be precise it’s the ETA 2824-2 which is an extremely popular movement used by many top brands as it’s reliable and very accurate. The movement has a 38 hours power reserve which means it keeps going for quite some time from a full wind after being left unworn. As you’d expect to find in a luxury Swiss watch, we have the sapphire glass in use. But it’s not your cheaper flat glass, this one has a slight dome to it which actually cost a fair bit more to produce. Sapphire glass is great for watches as it has a Mohs hardness rating of 9 meaning you’d need a diamond to scratch it. So with brilliant scratch resistance, you’re getting some of the best glass available for a watch. 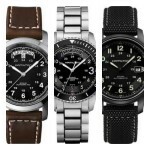 When it comes to sizing, everything is rather standard for a men’s large watch. The casing diameter is 42mm which has been a very popular size for quite some time. While the casing thickness is 12mm which has also become a standard size for men’s watches. 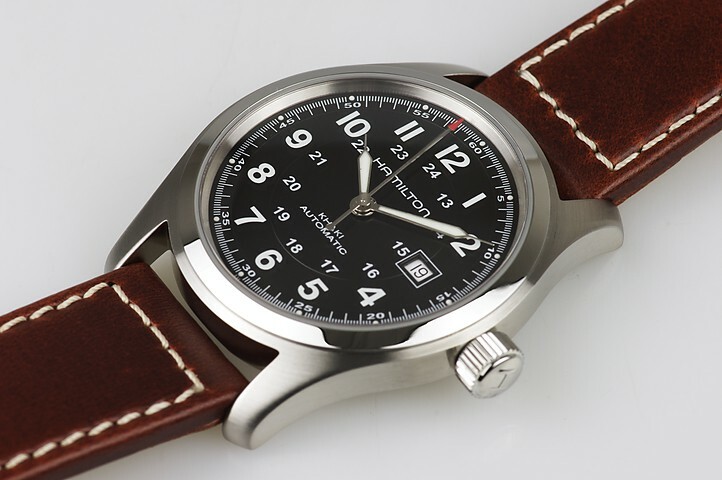 Overall the watch is quite a popular large size, that I’m sure many of you are quite use to. There’s a rather simple date display at the 3 o’clock position on the dial. Due to it being a basic date function, you will need to adjust it for the varying amount of days in each month. The strap is made of a soft genuine leather and fastens with a typical buckle. I like this stitching they’ve gone for as it adds a nice bit of detail. The strap is secure, and slightly thickness than a standard strap which I feel is worth point out. The width of the strap is 21mm which is a standard size. The water resistance rating is a good 100m, or 10ATM. 100m water resistance makes it suitable for recreational surfing, swimming, snorkeling, sailing and water sports. 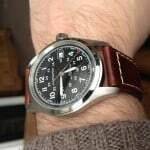 I think it’s fairly easy to see why this watch is such good value for money. 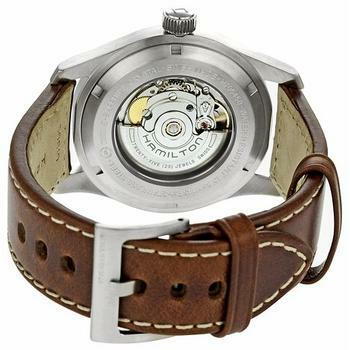 Hamilton has used lots of high quality parts to bring this Khaki watch together and I think they’ve done very well with the overall design. It gets a 9/10 from me for value for money, I’d recommend considering it if you’re after an affordable Swiss automatic watch. I Hope you found this Hamilton H70555533 review useful and enjoyable, comment below and let me know what you think of it.